With the CrossFit regimens, marathons, triathlons, Iron Man competitions and even the Tough Mudder, physical fitness is seeing new levels of popularity. The right shoes, the passion to compete and a disciplined training program are keys to being physically fit and ready for battle. The gospel of peace is Jesus the Christ. 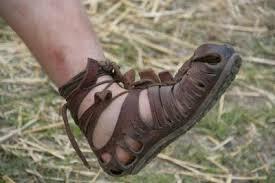 Jesus’ feet were fitted with sandals, the right shoes for His journey. He walked with a passion for the absolute Truth in a world under the influence of relative truth. The people could not tolerate Truth even as He stood before them. And He displayed a discipline in obedience to His Father, obedience all the way to the point of death on a cross. Boldly stepping forward in Truth, with discipline to obey His Word are keys to being spiritually fit and ready for battle. Honor the temple the Lord has blessed you with, your body, through good nutrition and regular exercise. Stay grounded in Truth, under the influence of His Word and in His love with a discipline that is the Lord in your life. Put anything that is inhibiting your personal, passionate & growing relationship with Jesus the Christ on the cross – nail it to the cross on Friday. And step forward on Sunday as a new creature in the power of the resurrected Christ. A faithful father keeps his feet fitted and ready with the gospel of peace. Your last bullet point really hit home about what Easter and Jesus dying on the cross stands for. Nail those sins to the cross and be free thru Him. Thank you for sharing this - I am going to pass along the link to parents of my young men's group.